Paneer Butter Masala with butter naan or roti is one of the most relished / favorite food items by many Indians irrespective of the region to which they belong. Here is an easy and quick way of making the recipe at home. The item comes out really delicious with freshly purchased paneer (Indian cottage cheese) and not the one which is kept in the fridge for few days. For a yummy taste freshly bought paneer without refrigerating it or refrigerating for a day or two, will do good. Soak handful of / 8-10 cashew nuts (quantity depends on the quantity of curry you prepare) in warm water for a while. Cut freshly bought paneer into desired size cubes. Shallow fry these cubes with little oil in a pan. If you don't like the taste of fried paneer, you can do without frying. Put these fried paneer cubes in warm water so that these turn softer and cooking becomes easier. Chop ginger, onion, tomato and coriander finely and keep aside. Heat little edible oil in a pan and saute few small sticks of cinnamon (dalchini). Add finely chopped ginger, onion, tomatoes and shallow fry these. I don't like garlic, so I do without garlic or ginger garlic paste. If you wish you can do so. Add salt to taste, turmeric powder, Kashmiri mirchi powder (red chilli powder) for added color and less spice and garam masala powder or any such spicy powder for added flavor. Add the paneer cubes, little water and stir it well. Place a lid and keep on simmer so that the paneer cubes are cooked. Meanwhile, grind the soaked cashew nuts to a paste. You can also make puree of 1 or 2 tomatoes. You can also grind cashew and tomato together for time saving and easy work. Add the pastes to the cooked paneer cubes in the pan. Keep stirring well over low flame for a while till oil separates and floats to the surface. Transfer paneer butter masala into a serving bowl and add cream / butter on top of it. 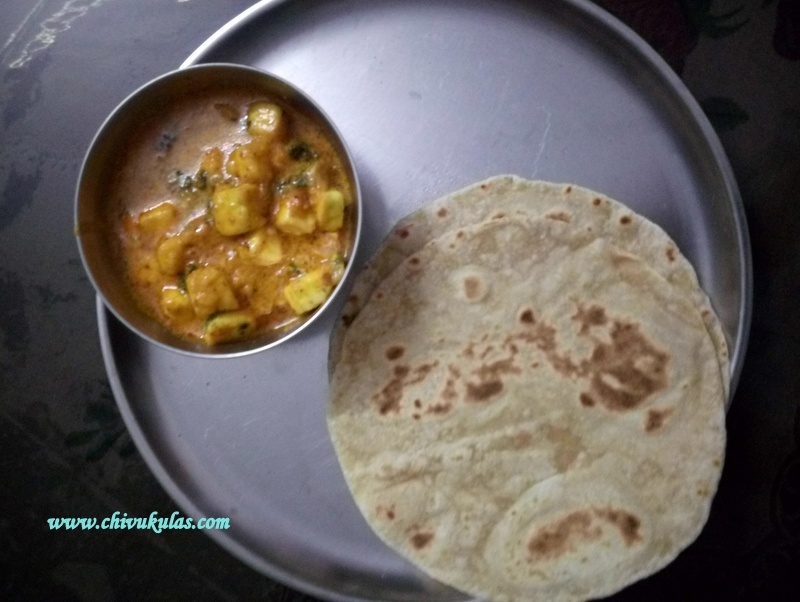 This is a simple and easy way of making home-made paneer butter masala. However, you may not get the typical hotel taste but it's yummy and healthy too. For a variation, you can add vegetables like capsicum (bell pepper), green peas or carrot as per your liking.